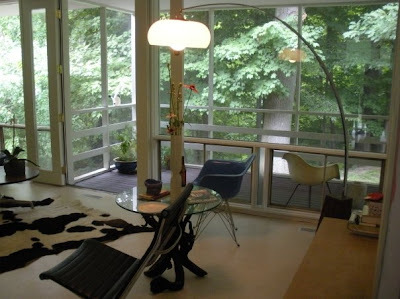 Mid Century Modern Mixer/Tour Rocked the House. First ever Atomic Crash Party came and went. In style. Passionate hipster-cool peeps descended. Estimated 60 people rolled through. Good vibe. $100 raised for Historic Landmarks Foundation. 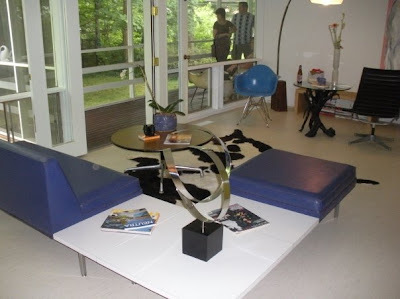 Should you find yourself head scratching, wondering what an "Atomic Crash Party" is - think home tour meets cocktail party. With a twist. A.C.P. is to be a one-home-per-month gathering. 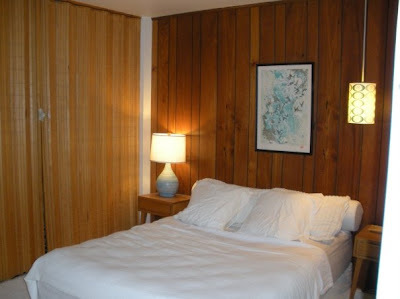 Casual atmosphere, allowing you to experience a home as it's meant to be - lived in. For those unable to attend, we shall conduct quick virtual tour of Jami's sweet pad. Starting with home's exterior. Front elevation. Home sits on a ravine with walkout basement. Well landscaped approach greets guests. Complete with bubbling brook. 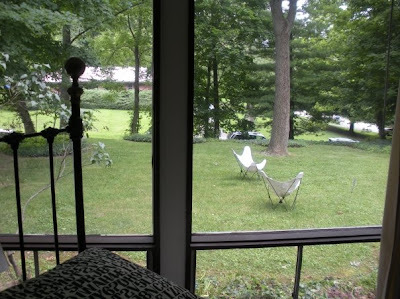 Butterfly chairs and privacy screen. Entire run of backside is a wall of glass. Starting in an odd place. Just love frosted floor to ceiling windows. Natural light abounds throughout home. Guest bedroom view out to front. Living room. Before crowd rolled in. 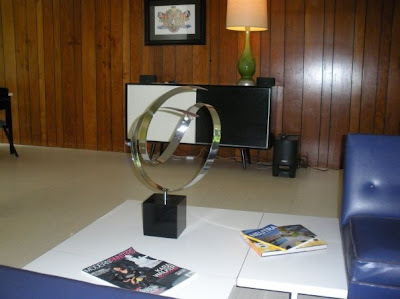 Image courtesy: Stefanie P. Sculpture on loan from Meridian Vintage. Brief pause to discuss "the man", J. Parke Randall. Parke is the home's original architect. He graced us by attending. If he had been donning shades and leather pants one would have taken him for a rock star. Crash Partiers flocked. Swooned. He responded graciously. 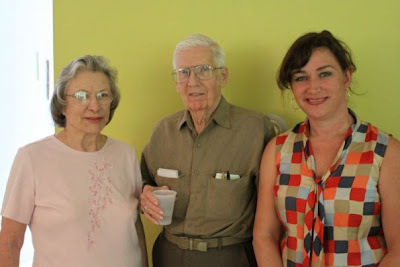 L2R: Mrs. Randall, Mr. Randall, Ms. Jami (Hostess). A true gentleman, Parke didn't come empty handed. Original specifications book, pencil renderings, and construction photos were laid out for viewing pleasure. 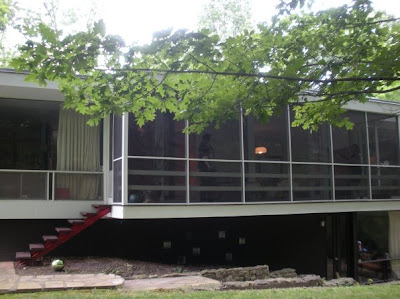 J. Parke Randall designed 12 modern homes throughout Indianapolis (later post will feature all homes). 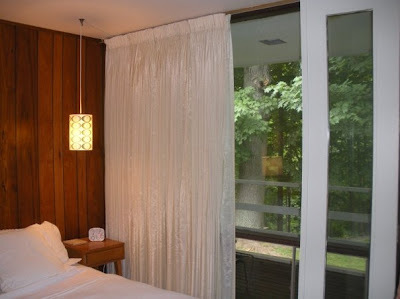 Parke was designing green back in the 50's, rock'n passive solar philosophies before LEED Certifications were conceived. Parke later applied his trade to more lucrative commercial projects including government buildings, jails, and libraries. Currently his legacy remains mostly undocumented. Atomic Indy and C. Resources, Inc. are working to change this. First round of interviews with Parke have taken place. More in depth interviews forthcoming. I smell a National Registry bid in the future. Stand by. Resuming Atomic Crash Party home tour. Dining room view toward front of house. Parke Randall working the room. Funky-cool space-age stack-able stools on loan from Meridian Vintage. Sweet, still-functioning, NuTone whole house intercom system. Holding out hopes NuTone will one day re-issue this system. Breath not being held. Post party photo session with our architect rock star, Mr. J. Parke Randall. L2R: Mrs. Baz, Mr. Baz, Mr. Parke, Ms. Jami (aka hostess with the MCM mostess). Was busy chatting up guests and failed to score more pics. 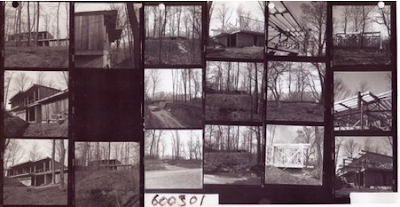 Majority of pics posted were donated by Carol Street, Ball State University's Architectural Archivist. Check her sweet blog here. Saw several other people with cameras. Please email your pics. Will continue to add them to virtual tour above. Atomic Crash Party #1 response was perfect. Eager questions about future events were flying. We're on. August event slated for Saturday, 8/22/09 1p-5p. Mark it. Details soon. Beautiful. Every square foot of it. This party was the epitome of cool. Cool architecture, cool music, and very cool people. Thanks to Baz, Jami, and Parke for making it such a great event! What an inspiration! I hope to build on your momentum in my little corner of the South. Our MCMs here (Birmingham, AL) are spread far and wide, so, I'm working to build a virtual neighborhood. I should step up and hold the first Atomic Crash at my pad. Oh I love it...I love that the architect came in tow with his drawings. I may be shamelessly stealing, I mean franchising, your ACP idea after my remodel. Can't wait to see the next event pics. I'd like to help you plan & promote an A.C.P revolution across the country. We can provide logo/signage art, and lessons learned. We'll create an A.C.P section on A.I. that lists all the events by month across the country with links back to you as the contact for your markets. Would love to see this spread. How cool! I wish I could have been there. Where is Indianapolis is this gorgeous place? This home is over on the east side in the 46th & Emerson area. 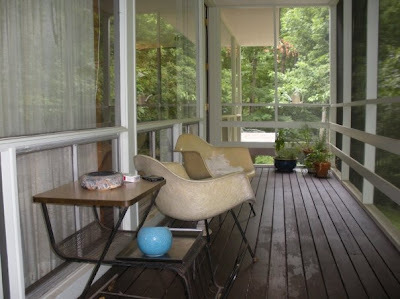 There are pockets of great MCM homes north & south of 46th between Binford & Arlington. Fabulous! Great pics and a great intercom! I am very intrigued by teh privacy fence, can you tell me how it is built / what materials?? I would love to do that to my home in Michigan. Thanks, I had no idea! I'd love to come back to town wheneever you have the next one. The privacy screen is constructed from standard fence posts and plastic (opaque white) corrugated panels. Pretty simple yet effective. You could substiture a variety of colors or materials for the corrugate panels. They come in opaque, translucent, plastic or metal. Let us know if you require more detail. I think this event is genius! I wish someone would do this in my area. If I had a home worthy of showing off, I'd start this myself. I especially love how the architect was able to attend. Phenomenal! The home is stunning and everyone looks like that had s fab time. Can't wait for next month!